ProForm Hybrid Trainer Review by Industry Experts! The ProForm Hybrid Trainer is ON SALE! Elliptical Trainer & Recumbent Bike in One at a Value Price! We want to make sure that our readers get quality equipment that will not only ensure that they achieve their fitness goals, but also that the equipment will be reasonably durable and low maintenance. We don’t want to be responsible for individuals getting sub-par products, and blaming us for our recommendations. 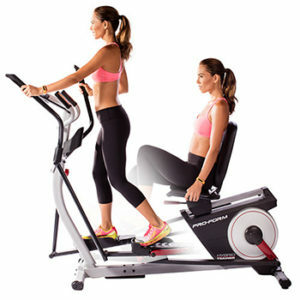 MID-WEEK SALE ENDS THURSDAY: The ProForm Hybrid Trainer is reduced to $349 with Free Shipping! The Hybrid Trainer XT is priced at $399. Financing is available! This is $20 OFF the Hybrid Trainer’s Regular Price! So how does this relate to our review of the ProForm Hybrid Trainer? Well the Hybrid Trainer typically sells for under $500, and that is getting you into the budget category, and inherently there has to be some compromises on the quality of the components and engineer to reach that price point. For example, you need to notice that the warranty on this machine is only 5 year frame and 90 day parts/labor. That is certainly less than ideal, but doesn’t seem to be stopping buyers from purchasing the machine. A significant portion of fitness equipment customers do not have a wad of cash to spend. And so with what little money they have, they are looking for the best value. In addition they want a machine that can help them get into shape and lose weight. That is why the ProForm Hybrid Trainer is the #1 seller for ProForm.com. From the feedback of customers it is obvious that besides the low price they find the hybrid nature of the machine appealing. Although by trying to combine two exercise machines into one, there are some compromises. Low Price – While this was initially a “turn off” for us, there are some advantages to this low price. It gives buyers an inexpensive fitness equipment option with multiple ways to workout. 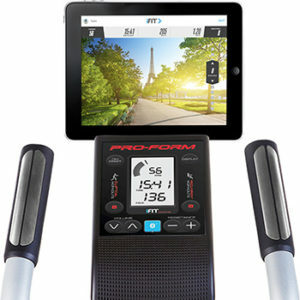 iFit Coach Ready – Just like the other ProForm machines, the Hybrid Trainer has the iFit Live programming. This allows users to create an online iFit.com profile where they can set goals, track workouts, and even download a customized and progressive workout plan tailored towards their goals. iFit Live also lets you sync to Google Maps so you can exercise on virtual routes around the globe. To read more about the benefits of iFit Live, check out this article. First, you have a small 15″ elliptical stride. 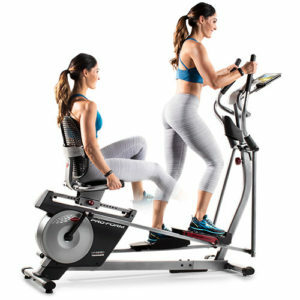 More expensive ellipticals generally have a minimum 18″ stride. One of our team members, Fred Waters, is 5’8″ and is most comfortable with a 20″ stride length. With a 15″ stride length you are going to have more of an oval stride rather than elliptical. We do like the fact that you can adjust the pedals to the angle that is most comfortable to you. Though they do not give flywheel weight, you can assume that it is rather lightweight, which will also compromise the quality of the elliptical motion. Second, this is not a very heavy machine, which is to be expected at this price range. The light weight is not an issue in the recumbent bike mode, but as an elliptical you may have some stability issues for overweight individuals. They suggest a 350 lbs. user weight limit, but we would put it at around 230 lbs. The ProForm Hybrid Trainer XT is identical to the regular Hybrid Trainer with a slightly different look. As a recumbent bike the Hybrid Trainer seems to work well, and is probably comparable to other exercise bikes in this price range. In fact, we would say that the Hybrid Trainer is basically a recumbent bike that also allows you to cross train. If you look at the ProForm website, you will see a model called the ProForm Hybrid Trainer XT. Overall, this model is almost identical to the regular Hybrid Trainer. The original model is slated to be phased out and this XT model is going to take its place. It has a slightly different look and the pedals are a bit easier to flip up. For now, we recommend you go with model that has a lower price. ProForm Hybrid Trainer Pro – Read our full review here. The most appealing aspect of the ProForm Hybrid Trainer is the range of use. You are able to get a cardio workout in a sitting position, or you can get a dual, lower and upper body workout in the elliptical mode. This allows you to not only burn calories but exercise numerous muscle groups. Once again, realize this is a budget machine and the quality is not what you will find in a health club. 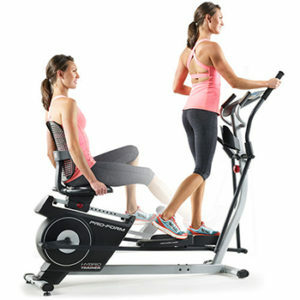 We would recommend the Hybrid Trainer for moderate exercisers, not workout fanatics. You may also want to check out the ProForm Hybrid Pro for a larger 17″ stride, more programs, more resistance levels, and a stronger warranty. That said, the Hybrid Trainer appears to be a success with customers and it may be the answer to your fitness needs.